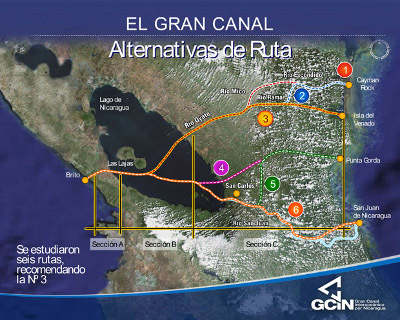 Daniel Ortega, who holds the office of President of Nicaragua in defiance of Nicaragua's Constitution, is championing a mega-project; a canal across the eastern part of Nicaragua that would provide an alternative to the Panama Canal. The estimated cost is $40 billion. My initial reaction, when I heard about this is, Nicaragua's GDP is only $10.5 billion, and no foreign investor would be foolish enough to put up this kind of money to finance it. I was wrong. Chinese billionaire Wang Jing is putting up the money, through the HKND Group, based in Hong Kong, and registered in the Cayman Islands. Jing and other Chinese see this project as reducing the time (and thus the cost) required to ship oil from Venezuela to China, and Chinese goods to the eastern United States. The HKND Group has contracted the China Railway Construction Corporation (CRCC) to do a feasibility study. CRCC is owned by the Chinese government, and was responsible for part of the Three Gorges Dam project. Why do I say that this is a bad idea? Although there are several possible routes across Nicaragua, all of them go through Lake Nicaragua, which is a large body of fresh water, and environmentally sensitive. Connecting Lake Nicaragua to two different oceans will not only introduce salt water to the lake; it will introduce exotic species. The canal would also introduce large container ships, which will inevitably spill oil, sewage, and other chemicals. I made my first trip to Peru in 1986. During this trip, must of the Peruanos that I came in contact with who were capable of speaking English had some very unkind things to say about a Gringa visitor a few weeks earlier, Shirley MacLaine. MacLaine went to Peru to make the film “Out on a Limb”, and she went there with the firm conviction that Machu Pichu and other Andean archaeological sites were constructed, not by back-breaking and rock-breaking labour by the ancestors of the present-day Quechua people that I talked to, but by space aliens. Do you see why this is a problem? If not, here's an anecdote, from my last day in Peru on this trip. I went to the ruins at Pachacamac, south of Lima. It's more than just a well-restored set of ruins; it's suspected of having archaeoastronomical value. I was joined on the tour of the place by a middle-aged woman from the US and her son. As soon as we started out, the woman started insisting that we make a stop at the Temple of the Sun, because she wanted to “feel the energy there”. The guide had already said that Temple of the Sun was one of the stops on the tour, and he reassured her that we would be stopping there. That wasn't good enough. She started talking to him in pidgin, even though he could speak conversational-quality English. The told him that she was a “medium”, and spelled it out: “M-E-D-I-U-M”. This anecdote was brought to mind by a gathering of 7,000 New Agers that took place at the Tikal ruins in Guatemala on December 21, 2012. They had ceremonies with elaborate costumes and “shamans” speaking gibberish, with the overall idea of being at the Mayan ground zero when the end of the world takes place. While they were doing this, the genuine Mayans, who have lived in southern Mexico, Guatemala, and Honduras for 5,000 years, were wondering, “What's with these crazy Gringos?”, fully aware that their culture made no such end of the world prediction. In the aftermath of mass murders in Newtown, CT, Aurora, CO, and Clackamas County, OR, several sensible ideas have become topics of public discussion: banning the sale of assualt weapons, banning the sale and ownership of clips that hold more than five bullets, and banning sales of guns to purchasers who have not had a background check. It's the last of these ideas that I'm writing about here. It's about what's commonly referred to as the "gun show loophole". Although background checks are required for retail sales of guns, they are not required at gun shows. This obviously makes it easy for convicted felons and mentally ill people to purchase guns. However, another class of people that takes advantage of this are Mexico's narco-terrorists. They simply hire people to purchase assault weapons at these guns shows (usually in Texas and Arizona) for them, then transport them into Mexico. According to a report issued by the US General Accounting Office in 2009, "While it is impossible to know how many firearms are illegally smuggled into Mexico in a given year, about 87 percent of firearms seized by Mexican authorities and traced in the last 5 years originated in the United States, according to data from Department of Justice’s Bureau of Alcohol, Tobacco, Firearms and Explosives (ATF). According to U.S. and Mexican government officials, these firearms have been increasingly more powerful and lethal in recent years. Many of these firearms come from gun shops and gun shows in Southwest border states." Current TV aired an expose on this, the Vanguard documentary Arming the Mexican Cartels by Christof Putzel. For the mostly peaceful people of Mexico, this is a tragedy. The number of deaths from the civil war that has been going on in Mexico over the past six years has been at least 57,500, and estimates run as high as 100,000. The parents, children, brothers, sisters, and friends of the people who have been killed are just as unhappy about it as the parents, brothers, sisters, and friends of the of the children killed at Sandy Hook Elementary School. The high-paid employees and the Board of Directors of the National Rifle Association have blood on their hands. Put a stop to unlicensed gun sales in the US, and Mexicans will benefit, too. I watched the documentary "The Queen of Versailles" when it was in the theatres. It's a powerful piece of work. I had several reactions to it, but I'm going to discuss only one of them here: that North America might not be that far away from a major torches and pitchforks scene. The subjects of "The Queen of Versailles" are David and Jaqueline Siegel. Jaqueline is the trophy wife, and David made a fortune selling time-shares, but got burned badly during the 2007 crash. David Siegel got his name in the news during this past week. At the request of Mitt Romney, he sent out a letter to his 7,000 employees telling them that if Obama wins, he will have to fire some of them. Well, isn't that special? Siegel's buddy, George W. Bush, was President in 2007, when the same David Siegel laid off thousands of his employees. So, if you happen to be an employee of Westgate Resorts, it would be a good idea for you to be looking for alternative employment regardless of who wins the 2012 election. Anyone who would attempt to build a 90,000 square foot house is a fool. Siegel made his fortune off suckers, so it's not surprise that he and Romney are buddies. If you don't believe this, go to Craigslist and check some resale prices for timeshares. For example, the asking price for timeshares in Punta Gorda, FL is $600. That's one-tenth of what units like this cost when they are new. Fact of the matter is, Siegel is a scam artist, and he falls in the same category as Lehman Brothers. When they talk about limited government, what they really mean is, let's protect our right to fleece people. And Mitt Romney is totally on side with this. Romney has also said that Russia is the "number one geopolitical foe" of the United States. It seems that this is meaningless as long as there's money to be made from Russia. Or was this part of a secret plan to make Russia a weaker "geopolitical foe"?